My wife and I decided to spend little time trackside after supper. I picked a spot near Verndale where I would be able to spot westbounds as they traversed the Wing River valley. 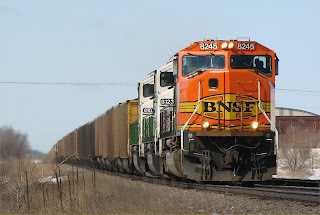 It wasn't too long a wait until I spotted by first train-coal empties headed back to the Powder River Basin for a reload. This mash shot gives a good idea of the dip trains need to traverse when crossing the mighty Wing. 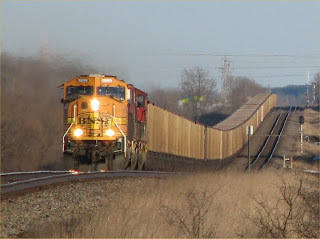 This is one location that adds a little bit of interest to train photos taken in the prairielands of Central Minnesota, especially this time of year when the snow is gone and nothing has started to green up yet. I shot the same train again as he approached the crossing where we were parked. A few more minutes waiting and I spied another headlite in the east, this train was general merchandise behind a pair of GE's sandwiching an H1 SD40-2. 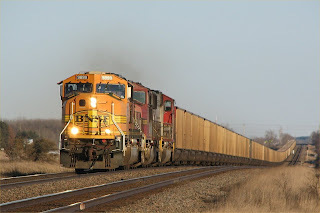 The last train of the evening was another coal empty-this one was headed up by a repainted SD75M. Most of them are still in the warbonnet scheme. 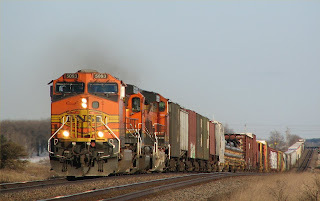 This one was trailed by a pair of the renumbered "Green Giant" SD60M's. All in all it was once again a great way to spend the evening. Please click on the photos for a larger image.